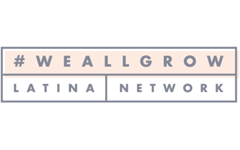 This is a compensated campaign in collaboration with Hunt’s Tomato Sauce and Latina Bloggers Connect, but the stories, views, and recipe are ours. One of my favorite childhood memories of food is having a hot bowl of tomato soup with melted mozzarella cheese on cold, lazy nights. On these occasions we would all gather in the kitchen while my mom made this red and creamy soup, and when we finally had the first spoonful, a long and thin string of melted mozzarella would hang from the spoon, all the way down to the plate. I’ve always been a huge cheese lover, so I may even have liked this dish as much for the melted cheese as I did for the incredible tomato taste. Latinos are known for making everything from scratch, but tomato soup is one of the few dishes we commonly prepared from a package at home, as it was so easy to make this way, and from what I can remember, delicious. I say “from what I can remember”, because I never eat processed foods anymore, and I’m sure my palate has changed so much that I might not enjoy an instant soup anymore. These days, I make my tomato soups from scratch when I want to recreate this comforting dish, with different results depending on how I choose to prepare it each time. It may be chunky, creamy, heavy on the basil, or very basic depending on how I feel that day, and sometimes I may even add some pasta or beans to turn it into a full meal. 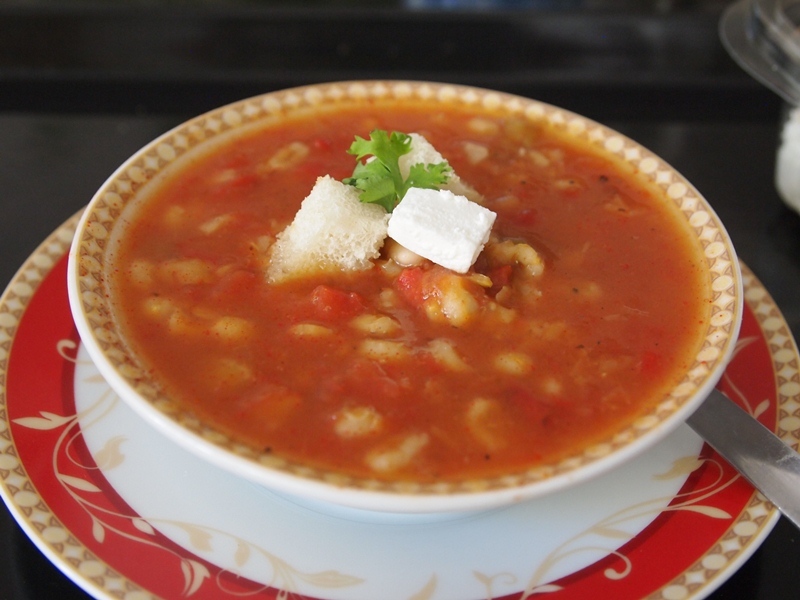 I also make sure I use fresh ingredients whenever I can, but in the winter, which is the time of year when I crave this soup the most, tomatoes are not in season, and they are pretty tasteless. When cooking with tomatoes during the winter, I tend to choose jarred tomatoes or those that come in tetra paks instead. 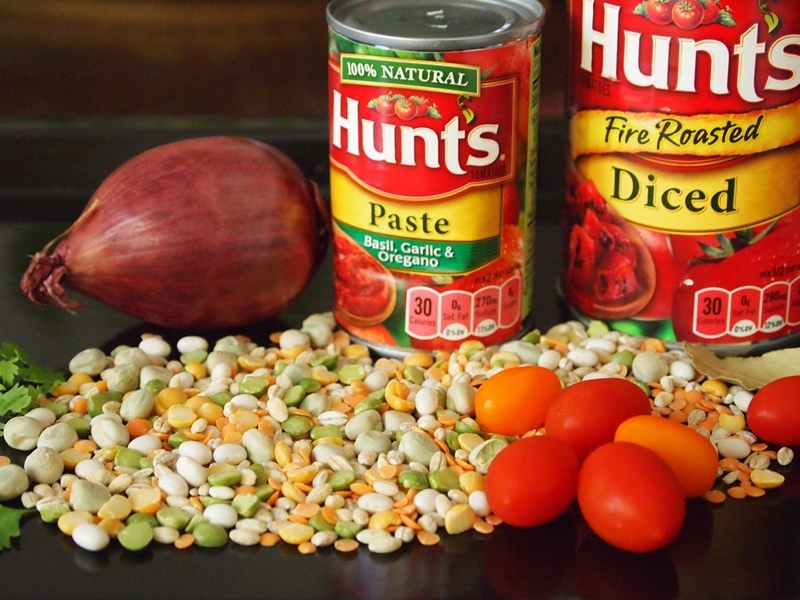 For this campaign, we were asked to give a Latin twist to a recipe from the super varied and useful Hunts Signature Recipe Collection, using Hunts tomato products. My mom and I scrolled through all the recipes of this collection, and discussed trying several of them for this post. 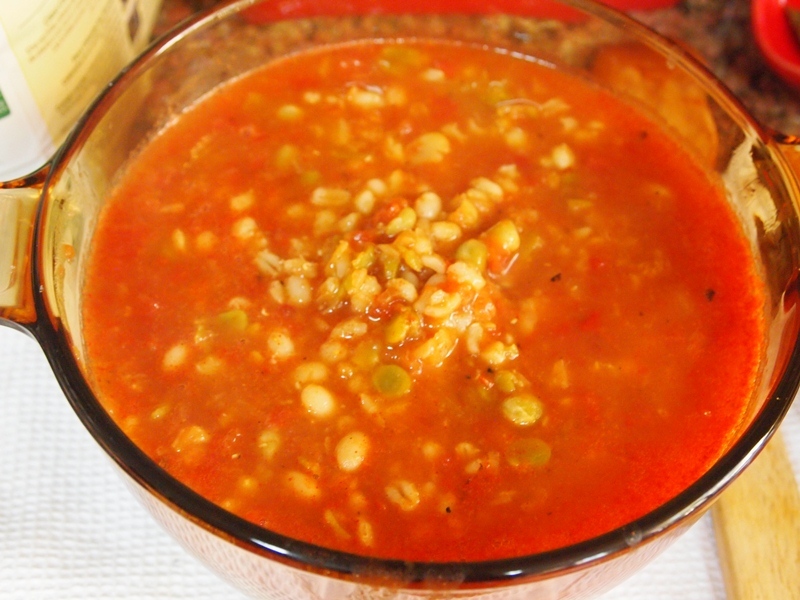 Unsurprisingly, we decided we would make a chunky tomato soup with lentils, barley, and wheatberries, resembling the thick and sturdy soups eaten in the Andes of Peru. We really enjoyed working with Hunts products, knowing that they have no artificial preservatives, and that they are packaged within hours of being picked. These tomatoes grow in sunny California, which is the perfect weather to get the reddest, juiciest tomatoes. Unfortunately, I didn’t find them in tetra paks at my local grocery store, which is the way I prefer to buy them as they keep the products fresh for longer, and they’re resealable. For this reason, I got canned tomatoes instead this time. This is an ideal product for all those Latinas who want to keep cooking their staple dishes (which include tomatoes in many cases), yet need the convenience of skipping one step (peeling, deseeding, and chopping tomatoes). 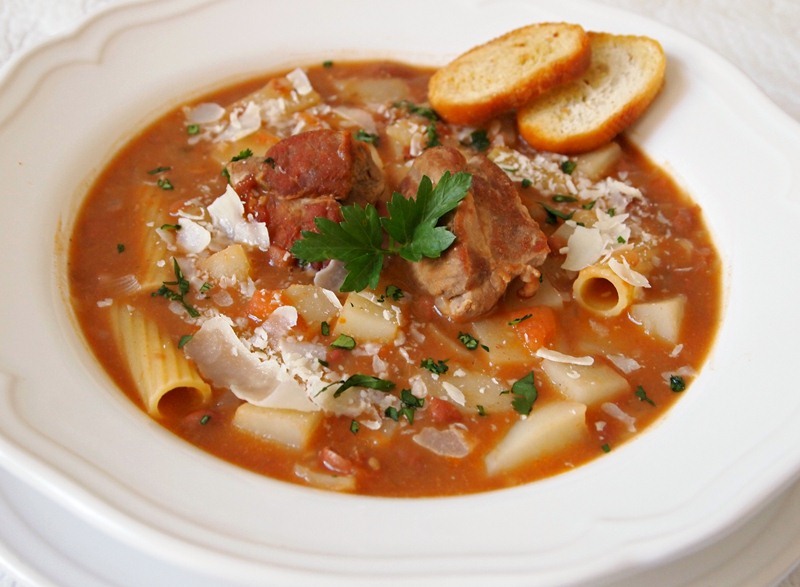 It was lots of fun making this new, fresh version of our traditional tomato soup together. We’re in the Middle East on vacations, so we even replaced the mozzarella with some local feta cheese (yum!). I hope you try it, like it, and feel motivated to start cooking more with your kids, significant other, friends, or on your own. There’s no better way to get nourishing food and to keep traditions alive than to cook at home and share a meal. 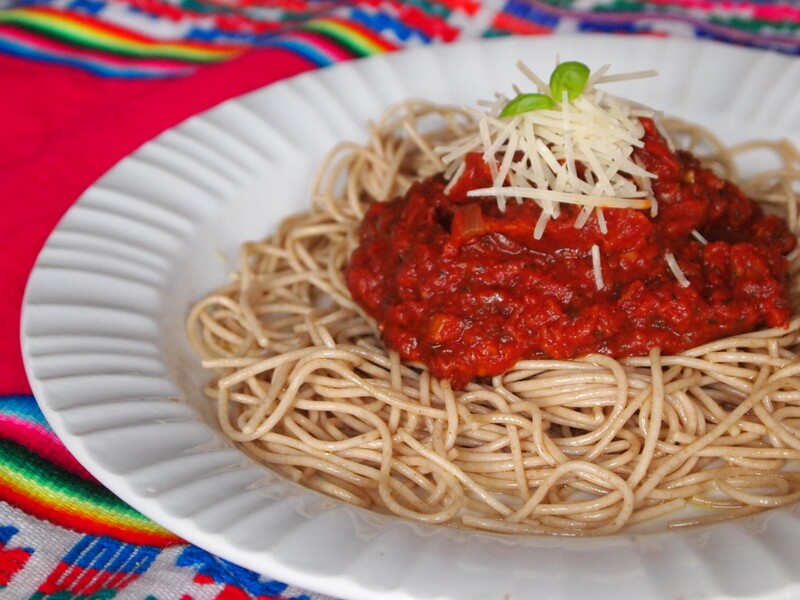 You can get many more ideas from this recipe collection, which is designed for the busy mom who has little time, yet whose top priority is to provide the best quality meals for her family. So…get cooking! 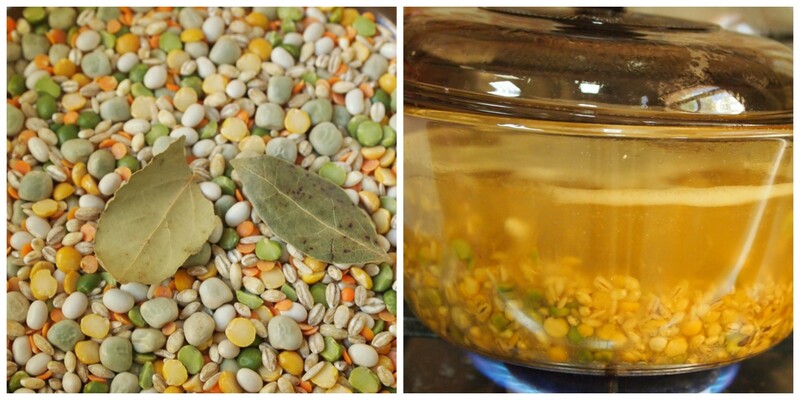 Wash the soup mix and put in a saucepan with water to cover and the bay leaves. Bring to a boil, lower the heat and simmer until all the ingredients are tender. Heat the olive oil in a pan over medium heat, add and sauté the onion and garlic. 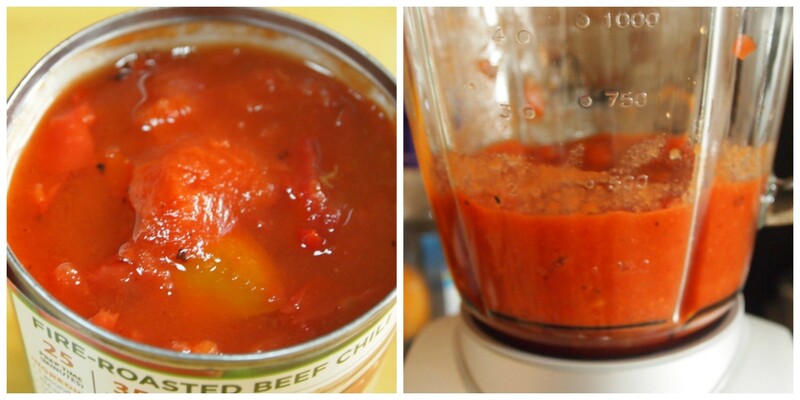 Put the can of Fire Roasted Diced Tomatoes in the blender, along with the onion and garlic and process until creamy. Add to the pan with the lentils. 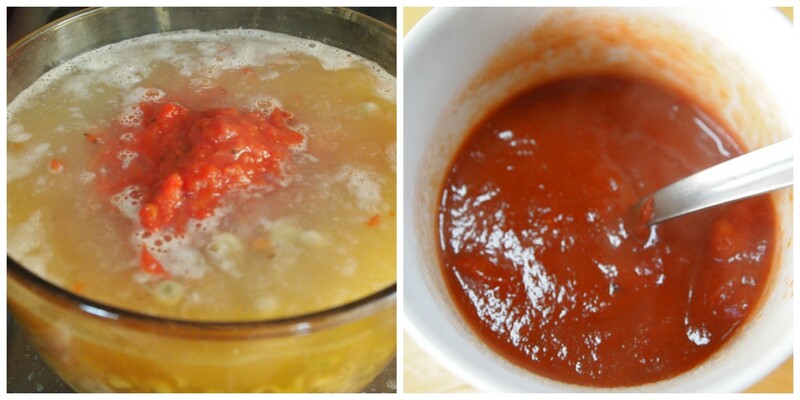 In a small bowl dissolve tomato paste with ½ cup of the cooking liquid, and put back into the pan, stirring. Add salt and pepper, and continue cooking until barely thick and tasty. Add the cherry tomatoes, if using, turn off the heat and stir. 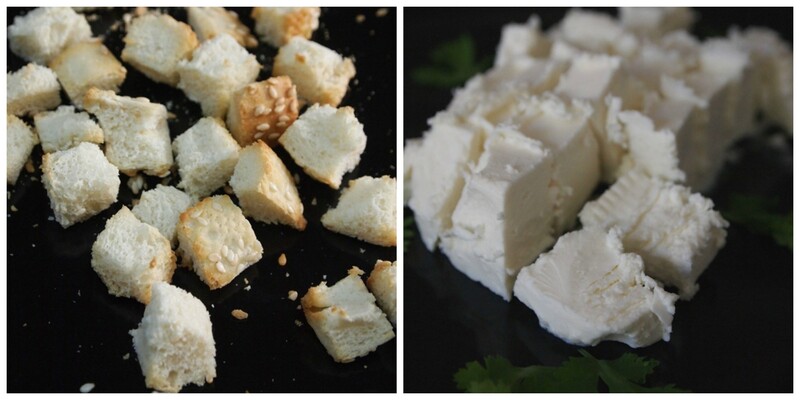 Serve in soup bowls with croutons, diced Feta cheese, and cilantro leaves. **To make croutons in the oven: cut slices of bread in dices, and toast in a hot oven until crispy. Keep this in tightly sealed tins. What a delicious combination! This soup is made for these late fall days. Yum!